Hey Guys! Okay so I have been seeing a lot of people put on palazzo pants of recent, and sometimes I love the look and other times I do not. 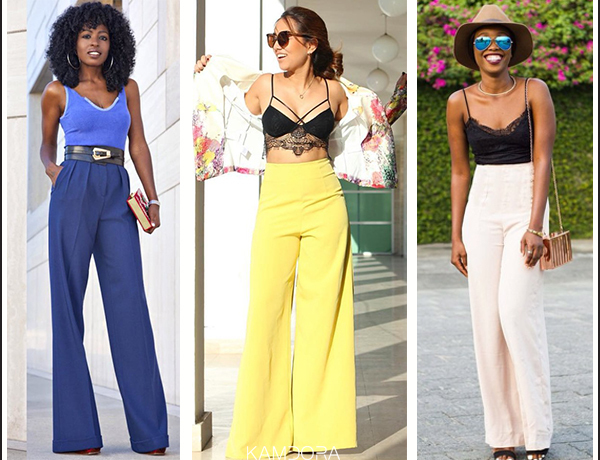 And I am thinking to myself, “why not put up something about how to slay in a palazzo pant?” So here you have it guys. I do not think some kind of tops are to be worn with palazzo. I would rather wear a body-hug kinda top to an overly free one, because a palazzo pant is big enough. Lol. Although there are a few exceptions to some big shirts that can be worn and I would share that here too. Notice how @stylepantry, @sinculpa and @iamdodos slayed the looks!!! I’m so in love with this particular look on @iamdodos! And it just shows that the cape can be long or short at the back, and so preferably short in front. Go @stylepantry! Go @stylepantry! You need no words to tell that this is so beautiful. Again we have @stylepantry and @iamdodos slaying this look! It’s so obvious that they love palazzo pants. Lol, you should too. So like I said earlier, these are exceptions to rocking big shirts and palazzo. The final on the list is a peplum top and we have @stylepantry serving us this hot look! You just took the words right out of me…Beau-ti-ful. These work is amazing and to think my mind was jst stuck on palazzo and croptops. Its like you showed me a whole new light! More grease to ur elbow! You just took the words out of my mouth Beau-ti-ful, and to think i thought it could only be matched with a crop top. You showed me a whole new light! More grease to your elbow! OMG!! What a fabulous article Alma. Really concise and straight to the point. I never knew they were called Palazzo pants until the amazing article. I will be trying them out soon. Lovely article again. Thank you Karen. I’m really glad I was able to help. And amen.